From what I've seen the genuine panniers aren't too wide but they aren't very practical. My NC : 700X manual, 2013, owned from new. Pretty unimpressive that neither Honda nor Givi can supply a rack for the 2019 bike. Top box all day for me. I second that. Not sure you can fit a suit without it being folded multiple times. I’m not at home at the moment otherwise would check for you. I do agree with Ciaran, however, in that width is not a major issue. I faced the same thing when I bought my ‘14. The rack changed colour to match some of the other plastics/grab handles and wasn’t available for some while after the bike. It’s perfectly understandable from a third party because they don’t know what model year changes will bring, but from the designers?? And Honda U.K. must have the worst website in the business. The Honda panniers are the worst design and shape I've ever encountered. However, they are not too wide, the handlebars are the widest point on the bike. While the panniers may be rubbish for touring they are perfectly capable of taking a suit, some shirts, shoes etc. probably. Yes you'll need to fold your stuff carefully but that's true of most panniers and transporting a suit. I've never been a top box fan either. Rack and panniers that fit 2016 on will fit, try SHAD, small 23lt panniers 48lt topbox then you can leave your helmet locked inside the topbox. That sounds fair enough. As to the tickets you could have taken them and sold them on or maybe given them to a charity to use in a raffle.but if your happy with what you have been offered that’s good. When I retired one of the gifts from workmates were two BSB tickets for Brands. At the time I was physically unable to use them so I passed them on to a friend of Sue’s on condition they made a donation of half the face value to the Air Ambulance Appeal. 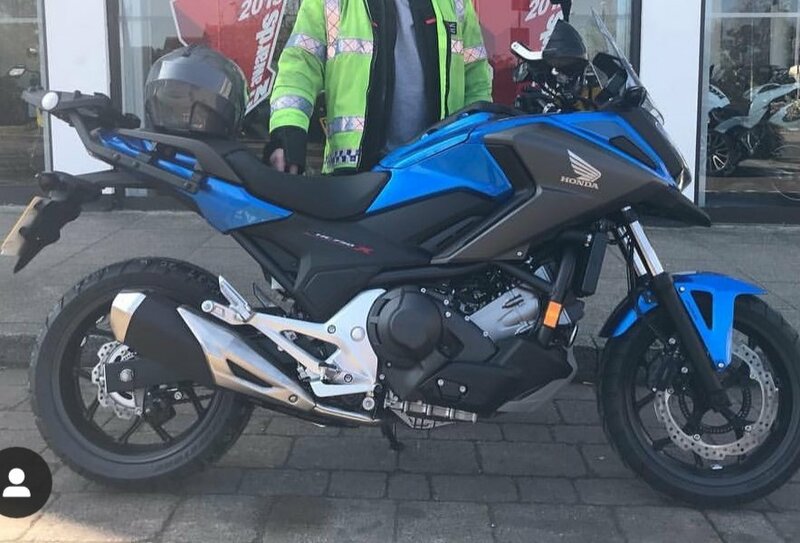 i have a 17 plate nc750x I have a spare Honda 39l top box arms and baseplate for sale, I changed to givi Aluminium boxes.... any use to you ? Panniers and their fixings are designed with a pillion in mind where the bike has a pillion seat. I've never had a problem getting on any bike with a set of panniers, however, there is the usual caveat that it really depends on the individual and what the state of your joints and their flexibility is. You see 80 year olds throwing their leg over without any problem while a 50 year old with a dodgy hip will struggle. Standing on the peg when getting your leg over helps.